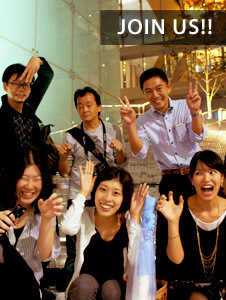 The best part about the Ginza Distirct is that it is mirror of present times and its trends. And just by looking at boutiques such as, Chanel, Louise Vitton, or Christian Dior, one can see that a catchy facade is the latest architectural trend. But is that all Ginza lighting is about? The Lighting Detectives wanted to find out more about the lighting environment of this trendy, but illusive commercial district in the middle of Tokyo. We split up in to 4 groups to cover five of the main streets: Ginza Avenue, Harumi Avenue, Namiki Street, Miyuki Street, and Hanatsubaki Street. While in Ginza, you can’t miss Ginza Avenue, one of the main streets of Ginza with an ever-changing face and home to fashion boutiques such as Chanel, Cartier, Louis Vuitton, and Opaque. The design of each boutique is sensitive to the finicky Japanese market, while trying to create a store facade that screams its own identity in this competitive era. This street is one of the busiest in the district, as shoppers are attracted to the eye-catching facade designs and on Sunday, when it is turned into a pedestrian mall. Compared to other streets in the district, we noticed that the pavement is a lighter gray and the asphalt used is of a lighter tone. Roadway reflection properties are lower along this street even though sufficient luminous levels have been secured. Harumi Avenue, another main thoroughfare in Ginza, is lined with boutiques such as Christrian Dior and Hermes; both with facades to rival shops on Ginza Avenue, but the main eye-opener along this strip are the neon billboards and signage. Advertising for large corporations occupies the top of many buildings along this wide street, forcing your field of vision upward. The lighting for these neon billboards is not stationary, either. A rainbow of colors are constantly changing and blinking to attract attention and were clearly visible even from the air on the lighting detective helicopter tour Dec. 8th, 2004. Lighting along Namiki Street is distinctly divided as it intersects with Harumi Avenue. 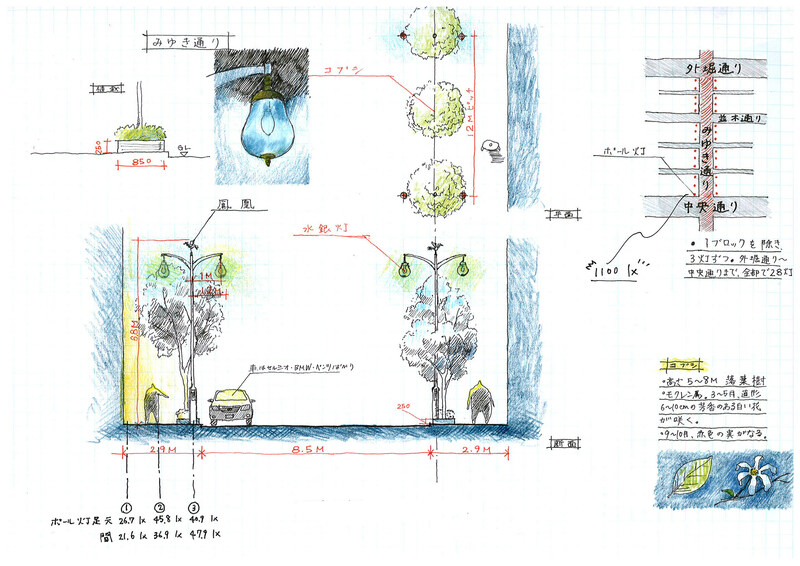 At this intersect the streetlamp design changes, but the light source, 250W Metal Halide lamp, stays the same. Historically, Miyuki Street was the route of choice for the Emperor when he visited nearby Hamarikyu Garden, where the name “miyuki” is derived from. The streetlamps are fixed with a golden Phoenix on top, an accent characteristic of only this narrow street. The Shidedo Building stands at the intersection of Ginza Avenue and Hanatsubaki Street, one of the main points of interest along Hanatsubaki Street. The lightly polished facade reflects the streetscape on its plane along with the glamour of the Ginza District. Streetlamps and department stores changed the streetscape of Ginza long ago, but today it is boutique architecture that is reshaping the Ginza of yesterday. 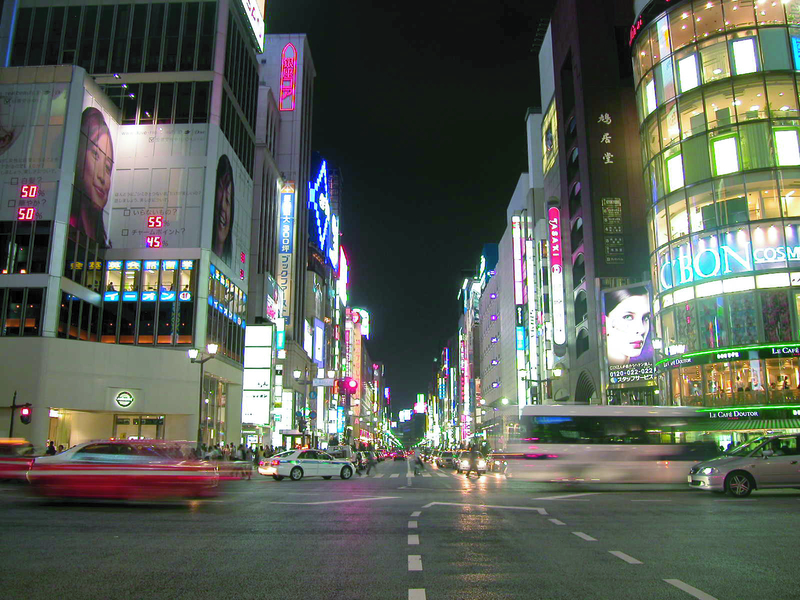 Lighting history in Japan can be traced over the years according the changes in the Ginza District. Gas lamps started during the Meiji Era, leading to arc lighting, and the neon lights of the Showa Period gave way to mercury lamps, but boutique facade lighting is without a doubt the main factor in today’s Ginza, overpowering the classic gas streetlamps that seem to get dimmer and dimmer.